I've been ill with a cold for the last few days. I managed to get through the week at work and finally succumbed to the cold on Saturday, the first of my last days off before Christmas. Consequently I am glad that I had decided the Aran Waistcoat of my earlier post would be better made for my Mother-in-Law as a birthday present. 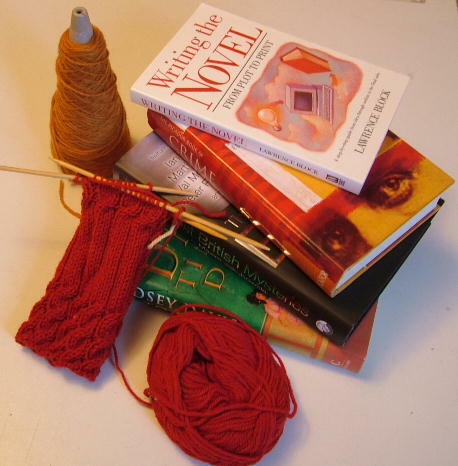 I felt no desire to knit at all on Friday (by the time I got home from work my voice was almost gone), or on Saturday, most of which was spent curled up on the sofa with a book. Luckily I'd felt this coming on and so had laid in a copy of The Last Breath by Denise Mina. More about that another time. Anyway, I'm feeling rather better now, have recovered my knitting abilities (such as they are) and have started the Aran Hat for my MIL. Hopefully, time permitting there will be Aran Mittens to accompany it. I've nearly finished Mobius too. It took a bit longer than I'd expected - vast amounts of long and dull stocking stitch on the back, coupled with a slowness of knitting, due to my mounting cold. But the major parts are all completed now, just need blocking and then I can knit the collar to the right length and stitch it all together. Big news though - we have our first egg! It appeared on Saturday, and we weren't sure which hen was the proud producer. It was sitting in the nestbox when Pete went to clean them out. It's only small, but it's the first one. On Sunday we were standing on the patio discussing which chicken was the most likely layer when Betty (she's the biggest of our girls, but a bit nervous) squatted down by the herb trough and laid another one with a resounding crack onto the paving slab. Miraculously it didn't break and she scuttled off looking a bit embarassed. We had them fried on muffins this morning and they were lovely. Probably the most expensive two eggs in history, given the cost of setting this all up, but well worth it! Here's to many more.